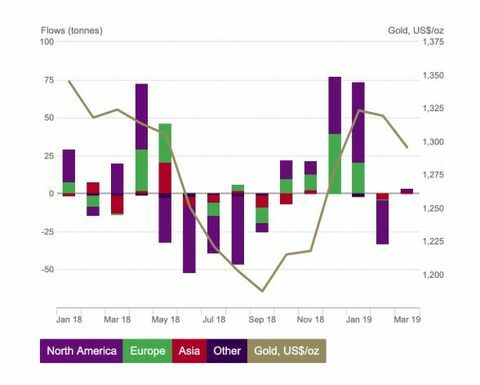 HOLDINGS in global gold-backed exchange-traded funds and similar products rose slightly in March by three tonnes to 2483t, equivalent to $183 million in inflows, the World Gold Council reports. 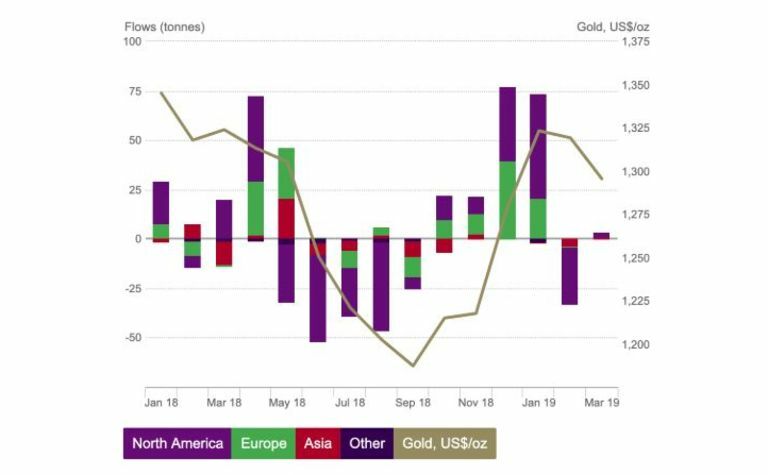 Global assets under management (AUM) fell by 1.6% in US dollars to $103 billion over the month, driven by the 2% decline in the price of gold during the same period. Global gold-backed ETF flows remain positive on the year ($1.9 billion, 1.9% AUM) on the back of strong January inflows. "March's marginal inflows appear to resume an upward trend in holdings. February's outflows may have been no more than a temporary setback for what has been a six-month plus of steady inflows. Holdings in UK-based gold-backed ETFs remain near all-time highs, likely driven by the uncertainty surrounding Brexit," the WGC said. Meanwhile, cocoa decreased $6 per tonne or 0.25% since the beginning of 2019, according to trading on a contract for difference (CFD) that tracks the benchmark market for this commodity. Historically, Cocoa reached an all-time high of 4361.58 in July of 1977 and a record low of 211 in July of 1965. The price of Arabica coffee dropped as much as 4% to $90.6 per pound yesterday, the lowest level since September of 2005, as a global oversupply weights on the market. Farms are selling their coffee below the cost of production while Brazil and Colombia expect a big harvest this year due to favourable weather. Historically, coffee reached an all-time high of 339.86 in April of 1977 and a record low of 42.50 in October of 2001.